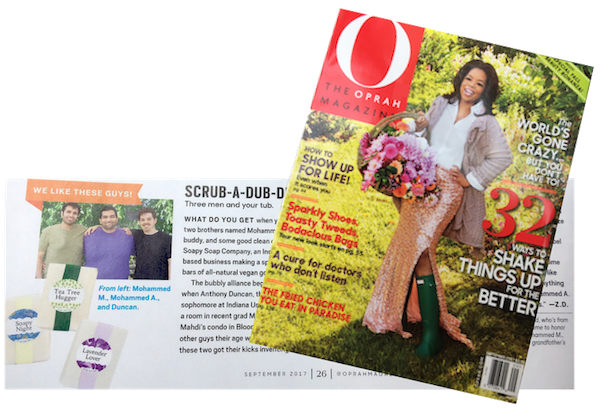 O, The Oprah Magazine digital article: How Three Guys Started a Vegan Soap Company. Published September 2017. O, The Oprah Magazine print article, Live Your Best Life Section: We Like These Guys! Scrub-A-Dub-Dub, Three Men and Your Tub. Published September 2017. BLOOM Magazine article: Latest Soapy Soap Endeavor Lets Customers Design Their Own Soap. Published May 26, 2017. Bloomington Parent article: Hidden Gems: The Best Finds Only The Locals Know. Published October 5, 2016. SOUTH Magazine article: Good, Clean Fun. Published September 9, 2016. Columbus Magazine article (page 28): Good, clean fun. Published Summer 2015. BLOOM Magazine article: Soapy Soap Company: Making Very ‘Friendly’ Soap. Published August/September 2013. 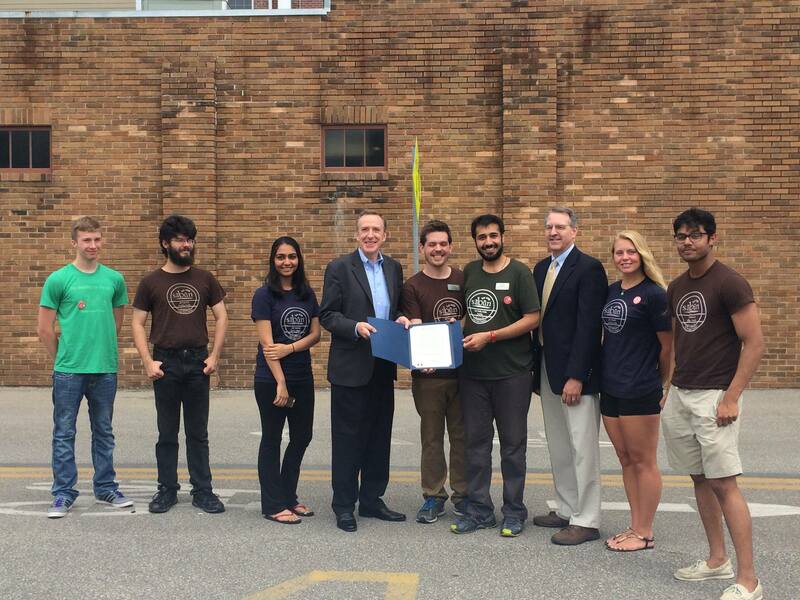 City of Bloomington, IN: Proclamation: Soapy Soap Company Day on June 17, 2015. Awarded June 17, 2015. Indiana Small Business Development Center (ISBDC): 2014 EDGE Award Winner for the category of Established Business. Awarded June 19, 2015. Powderkeg, via Facebook Live: Rise of the Rest Indianapolis Pre-Pitch Interview. Aired October 4, 2017. Inside Indiana Business: Soapy Soap Innovating Online Soap-Making Studio. Aired July 21, 2017. Kelley School of Business CIBER Internship Program promo video: CIBER Internship Program. Published November, 2016. Imantrepreneur interview The Soapy Soap Company Bubbles Up Advice with Anthony Duncan (Soapy Soap Company) - September 28, 2016. September 28, 2016. Kelley School of Business CIBER Focus interview: CIBER Focus: Mohammed A. Mahdi (Soapy Soap Company) - October 5, 2015. Published October 16, 2015. IDS Inside Magazine: Graffiti with Jake Huber Soapy Soap Company soap truck mentioned on IDS Inside Magazine Multimedia Edition. Original video posted @ https://www.idsnews.com/news/multimedia/media.aspx?id=57168&type=m. WISH-TV: IndyStyle.tv Soapy Soap Company on IndyStyle. Aired LIVE May 10, 2013. WFHB Bloomington: Big Talk! w/ Michael Glab: Soapy Soap Company. Published May 18, 2017. WFYI Indianapolis: Yelp Indy Continues Bicentennial Celebration With Bloomington Adventure. Published April 4, 2016. AgriNews article: Make Mother's Day Memorable: 5 Local Gifts for Mom. Published May 7, 2018. Dayton Daily News Online article: Liberty Center launches inaugural Pop Up Market. Published December 12, 2017. Huffpost, Huffington Post Online article: The Brandery Accelerator announces its 2017 cohort. Published September 3, 2017. WCPO Cincinnati article: At Soapy Soap's website, you can design your very own animal-friendly vegan soap bars. Published September 1, 2017. Cincinnati Business Courier article: Brandery announces class of 2017. Published July 26, 2017. Cincinnati Business Courier article: Protein powder, artificial intelligence and custom soap among new Brandery startups. Published June 20, 2017. Herald Times article (subscription needed to read full article): Soapy Soap Co. may be the smallest small business on Small Business Saturday. Published November 25, 2016. AgriNews article: Soapsmiths share their story. Published July 22, 2016. AgriNews article: Owners share their soap favorites. Published July 22, 2016. AgriNews article: Craft your own soap. Published July 22, 2016. IDS News article: Soapy Soap maintains quality during expansion. Published September 9, 2016. Indiana State University News article: Indiana State, Wabash Valley Small Business Development Center recognized for business development efforts. Published July 7, 2015. Herald Times article (subscription needed to read full article): Indiana small businesses EDGE past competition. Published June 25, 2015. Lafayette Journal and Courier article: Art in the Garden provides a home for handmade. Published June 24, 2015. IDS News article: Local artisans featured in Handmade Market. Published Nov. 9, 2014. IDS News article: Local soapmakers teach basics of craft. Published Aug. 14, 2012. IDS News article: City officials honor Citizens’ Academy graduates. Published October 14, 2012. GirlieGirl Army: The Most Heavenly Custom Blended Vegan Soaps. Published September 26, 2017. Happy Muslim Mama: Entrepreneur Interview: Soapy Soap Company and DesignMySoap.com. Published August 17, 2017. The Brandery Blog: Company Highlight: Soapy Soap Company. Published August 2, 2017. The Electron Pencil: MOHAMMED A. MAHDI & ANTHONY DUNCAN: The Full Interview. Published May 18, 2017. The Muslim Girl: Beauty Hajj Kit (Unscented and Halal) | Soapy Soap Company. Published August 11, 2016. Unplanted Co.: Kickstart Your Day with Soapy Soap Co.. Published July 18, 2016. Trend Hunter Eco: Bespoke Soap Ordering Services. Published July 14, 2016. Fragrant Vanilla Cake: Soapy Soap Review And Giveaway. Published July 1, 2016. Her Emerald Thumb: Soapy Soap Company Kickstarter. Published June 30, 2016. Unplanted Co.: Vegan Soap with Soapy Soap Co.. Published October 19, 2015. Honey and Dates: EID 2015 GIVEAWAY DAY 4: SOAPY SOAP COMPANY – SABUN SOAPS. Published September 10, 2015. Honey and Dates: Best Natural Body Washes. Published August 31, 2015. Food Allergy Gal: Great Finds at the Gluten Free Food Allergy Fest Columbus, OH. Published May 6, 2015. Honey and Dates: Product Review: Soapy Soap Company. Published April 1, 2015. 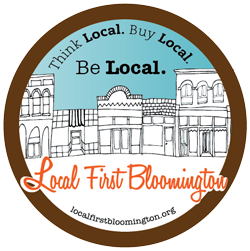 Bloomington Bucket List: Bloomington Handmade Market. Published Nov. 12, 2014. Be Ready Bloomington: Sabun Behind the Scenes. Published Aug. 25, 2014. Her Emerald Thumb: Review: Gardener’s Scrub Soap by Sabun (Soapy Soap)!. Published June 24, 2014. Vegan in Bellingham: Vegan Lip Balm Options. Published Oct. 6, 2013.